Learn more about how helicopters benefit can the utility industry in Alabama. The use of helicopters in the construction of transmission towers and the stringing of wires has made the process smoother, less time consuming and more effective than ever before. Especially when establishing Alabama transmission lines in areas that are environmentally challenging or remote. FairLifts works in conjunction with a network of national and global operators to deliver a fast, accurate and efficient alternative to what was formerly considered conventional in the utility installation industry. When you call, you will be asked a series of questions so experienced agents can determine the best course of action for you. They will source an appropriate operator and model of helicopter to facilitate aerial support for your project and then will coordinate the additional transport of equipment, supplies, and personnel if needed. Helicopters can access areas where terrestrial cranes and over the road vehicles cannot. 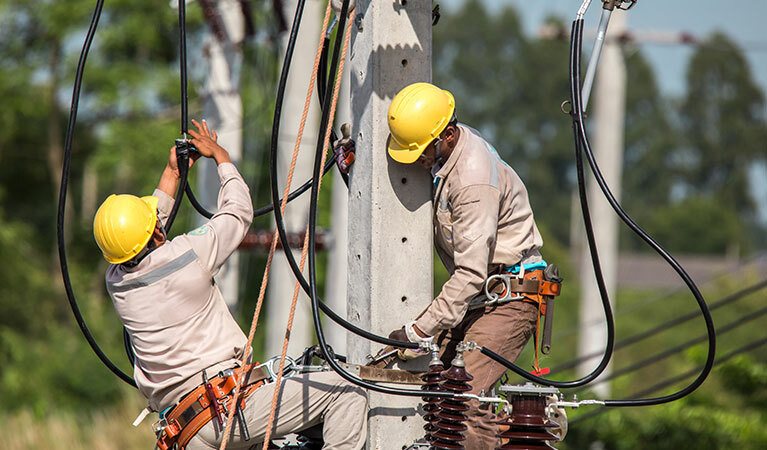 Decreasing the need for additional ground crews and making the process of constructing transmission towers take a fraction of the time it did in previous years. Smart contractors and utility entities know the wise choice in reserving helicopter services for Alabama transmission tower construction is FairLifts. Especially in a state where the terrain is extremely diversified. 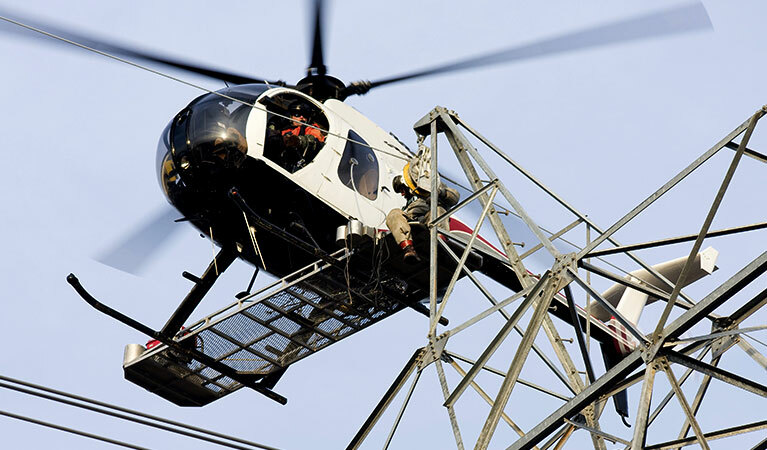 The state of Alabama is no stranger to the application of helicopter support in the pursuit of Alabama transmission tower construction services. The Tennessee Valley Authority or TVA as it’s commonly known made use of helicopters to establish a new 161-kilovolt line to power Huntsville Utilities as recently as 2014. And, who can blame them? Helicopters are exceedingly more efficient than ground crews and can easily serve to establish transmission towers in higher elevations than traditional terrestrial cranes. Given the remoteness of some substations and towers, it's easier for helicopters to reach them to establish connectivity or perform maintenance in those types of locations. And with a terrain as "mixed bag" as Alabama, helicopters are ideal in delivering aerial applications for utility support. Topographically, the state of Alabama is as diverse as it gets. The Tennessee River runs through a portion of the uppermost northern part of the state with the broken terrain attributed to the southwestern fringe of the Appalachian Mountains in the North East. Prairie lowlands occupy the centermost region commonly referred to as the Black Belt, while farther south, wooded forests extend on into the coastal plains thereafter converging upon the white sand beaches of the Gulf of Mexico. This type of melange in environmental types is ideal for the use of helicopters in the construction of transmission lines and towers. FairLifts agents can easily reserve Alabama transmission line construction services as a result of an extensive network of experienced and professional operators. Booking through FairLifts delivers personal access to the agent's expertise in sourcing an ideal operator, aircraft, and hardware to get the project done according to your specifications. Read on to learn more. Heavy lift helicopter applications are utilized to move crews, supplies, like concrete and steel, equipment and hardware to the location of the tower’s installation. Transporting these items via helicopter is more expedient, less intrusive to environmentally challenging regions and the most effective way to get accouterments to up to higher elevations. The driving in of utility poles and transporting of tubular steel or concrete used to construct pylons for transmission towers is made simpler via the use of helicopters. Especially in regions with a number of variances in the topography or in environmentally protected regions. Transmission lines made need to be strung across marshes, lakes, streams, mountain tops, etc. Experienced helicopter pilots and seasoned linemen can use helicopters to their advantage to make a precarious job in Alabama infinitely less challenging. In the past ground crews and linemen on ATVs inspected areas surrounding towers, ROWs, and lines. Although they still managed to achieve what they came for, it took days, sometimes weeks to cover the area surrounding a massive power grid. Helicopters inherent capability to hover at lower altitudes and their speed and efficiency allows for aerial inspections to deliver a wider more expansive view and to further inspect things closely when necessary. Inspections that took weeks before are now completed more precisely and in a matter of hours. Crews can be safely and securely transported to the site of tower installations in Alabama and beyond with helicopters. Not only can they deliver a number of linemen to an installation site, they can do so in remote or impassable regions and because of their capability to land and takeoff without the need for a runway, they are ideal to transport utility crews to offshore destinations and onto oil rigs. Experts are standing by to get you a fast quote for your transmission line job in Alabama! FairLifts agents are available 24/7 to provide you with information regarding all of the utility installation services at your disposal via local helicopter operators right here in Alabama. From transmission line construction to the simple movement of personnel to remote or offshore locations, we can coordinate your project's helicopter applications from start to fruition. Call us any time. We’re here to assist you.